You like this don't you? Its by Behnaz Sarafpour. Oh but its not available in some fancy schmanzy atelier or department store. if you want to know where to get it, look close into the picture and take note of that charm in the lower middle. Yup, its now available in select stores. Best of all, you only have to shell out $13. Charmed? I'm sure! looove that charm bracelet! 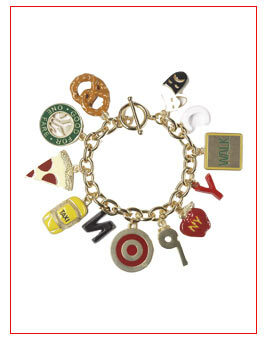 already e mail my sis in the us to find me that bangle, hahaha! You go for it girl! Good luck on the hunt! Hope your sister finds this pretty trinket!